I hate my camera phone, but you get the idea! Alhamdulillah, i prayed the ‘Īd salat at the park, and even though it is two minutes walk from my house, i still ended up rushing to get there on time. Why do i always take so long to get ready?! I wasn't even glamming up! Anyway… I MADE IT. And it was the best ‘Īd salat eveeeeerrrr! OK, i'm going to stop with silly Americanisms, that i don't understand. I sound daft! Eid in the park sounds amazing! It was more like a cattle market where I was. yeah, in Trinidad I went to outside salah, but so far in Canada it’s been, ummm, COLD, so we’ve either had it in the masjid or large halls. yo! Someone is having some fun! ha ha that was a cute post! Shaz, you could do salat in a big Eskimo coat! That would be sooooo cute (not sure how you’d manage ruku and sujood though). How do the Inuit Muslims do it?? Done it once, on dry grass! 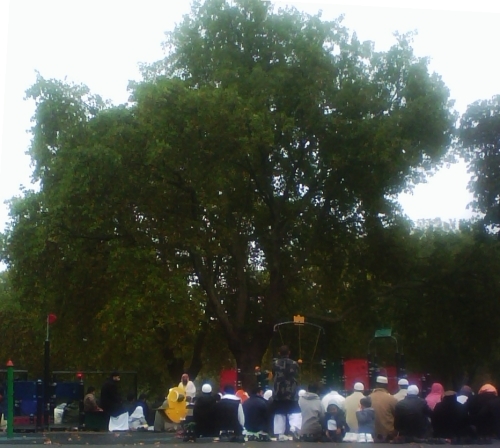 eid in park it’s really imaging… sorry here that’s can’t or park are not available. You know, I have three homes. One where I grew up- that’s where my parents stay. Then there’s one where my grandma lives- I call that ‘desh’ (country home). And the last is where I stay. We try to meet at our country home during Eid. There we have a very large and very old banyon tree by a cute pond full of lotus. The Eid Gah is below the banyon tree. It’s a wonderful place! Sad thing is, I couldn’t meet up my family this year. Eid Mubarak! Glad you had an amazing ‘Eid alhamdulillaah! *I* came up with the idea of doing the salah in the big park we have here, but when my dad suggested it to the organizers, they said it would be too much work to set it up. Hmph, lazy men! Manas: Jazakallah for clearing up the gah! Your Eid gah sounds beautiful, mashallah… oh i wish i had such lovely family traditions (other than the usual eating too much). Mouse: Why is it too much work? :( I had a FAB Eid this year, mashallah… especially on Sat, cos my parents and I spent all day at various houses, just chilling. The weather was much better in the weekend as well… so yeah, lots of fun! I’m too old for Eid money… i think i have to hand it out now. Though i’ve gotten away with it, cos i’m a poor student… not long before that exemption runs out though! Agh. Sumi: there you go with your lovely word usage again! :roll: Glad you had fun! Insha Allah!! I truly hope so! It is premissible to speak during the eid khutbah it’s not like the khutbah for Jummah but of course it’s better not 2 and If you do speak it shouldn’t be a speach filled with haram or one that disturbs the gathering. Anyway, jazakallah again for letting me know! It was wonderful to stumble across a British Muslim blog. I’ve just started out. NIce post! I’ll certainly visit back.